Sustrans’s Eleanor Besley dissects the government’s abdication of David Cameron’s claims it will be the “greenest government ever”. As big businesses inevitably seize upon new opportunities to encourage hand outs, isn’t it time that Cameron finally came out and admitted that the greenest government farce is finally, sadly over? As we anticipate the autumn statement, it feels inevitable that the lie that climate policy has (or will) drive industry overseas will be cemented in our upcoming approach on business taxation. This week’s declaration (£) from the head of the European division of Tata Steel of India stating that a planned £1.2 billion investment programme by his company in Britain could be put at risk by the UK government’s “over the top” climate change policies directed at heavy industry will inevitably cement chancellor George Osborne‘s aspiration to significantly reduce efforts to ‘green’ the UK economy. 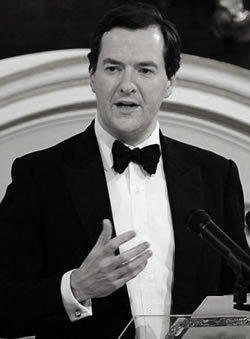 At the 2011 Tory conference, Osborne announced he will deliver his autumn statement (which replaces the Pre-Budget Report) on Tuesday 29 November 2011. The Office for Budget Responsibility (OBR) will publish its next report on the UK’s economic and fiscal outlook – which will include its latest revised estimates for UK economic growth – on the same day. The announcement is expected to deliver fiscal and monetary measures which are being packaged as “credit easing”. Among other strands, the easing process contains within it an assumption that green policies are “piling costs on the energy bills of households and companies”. It is therefore understood that the autumn statement could offer tax breaks and exemptions from new carbon levies for businesses. The message from the top seems to be that in the current climate, we must choose between green and growth. Despite energy secretary Chris Huhne’s enthusiasm for the energy review and his clear interest in seeing the UK leading the green field (to an extent backed up by Cameron) the chancellor said he’d made it clear that the current energy review should reign in Britain’s position as a green outlier, pointing out the UK is trying to meet tougher targets than any other major European economy and implying the situation should change. • What on earth did you think would happen? • Were you lying/joking or are you being bullied re: greenest government ever? • How on earth do you expect to pull your party image into the 21st century? • Seriously though, is Cameron strong enough? Unforgivably, the coalition itself has been committed to green taxes and associated charges which already add £100 to domestic bills, while imposing intolerable burdens on the businesses we depend upon for recovery. Leaving the peculiar sums applied to the domestic picture, the implication is that businesses cannot and should not pay additional sums that are associated with the greening of Britain. So not only has Osborne giddied his rabble, he has also led a large slice of the population to the false belief that green taxation will bankrupt both themselves and British industry. Central to Osborne’s approach is the lie that climate policy has (or will) drive industry overseas – this simply is not the case. The EU is subject to an emissions trading scheme (EU ETS) – the world’s most ambitious programme for environmental management, central to delivering Europe’s Kyoto commitments. Research from the Carbon Trust shows that, despite vigorously voiced industry concerns the scheme does not threaten the competitiveness of industry in Europe for most sectors, providing that EU Member States take a broadly consistent approach. Present allocations between different countries indicate wide differences, with several countries proposing allocations that appear likely to give a significant surplus to their sectors. This inevitably fuels the concern of UK industry about differential treatment. Moreover, such allocations will not get industries in these countries on course to meet their Kyoto targets and leaves them with the prospect of more rapid cutbacks in the Kyoto period of 2008-12. The low prices arising from these weak allocations mean that such differential treatment is unlikely to be competitively significant for any sector with the possible exception of steel. Such intra-European effects would become more significant at higher prices, reinforcing the case for a consistent approach to allocation across the EU. If the EU ETS is to generate significant abatement activity and get EU countries on track towards meaningful reductions, without distorting competition within Europe, the EU will need to act both to strengthen allocations and to ensure more consistent approaches between Member State allocation plans. Whether or not we aspire to lead or to move with the European pack on carbon reduction, it is clear that cutting taxation on big business will undermine efforts to ‘green’ British industry but will not confirm our position as a more competitive industrial or investment player. If we fail to get businesses on side, or worse, turn them against the green agenda, it will cost the economy and society a great deal in the longer term. Do you know something I need to get my grand kids into work they are leaving school while India America and the rest of the world f*ck up the world I’d say balls to it lets carry on.